Here are some thoughts on the Week 2 NFL transactions. For analysis of players put on injured reserve this week, check out this post. Texans (sign DEs Adewale Ogunleye and Ryan Denney) – After the injury of Connor Barwin, the Texans needed help at defensive end. So they added two veterans in Ogunleye (picture on right) and Denney. Ogunleye, a 10-year vet in Miami and Chicago, can provide some pass rush (he has at least five sacks in eight straight seasons) and also hold up against the run. He’s still a starter-quality player who can bookend Mario Williams and hold up throughout the season. Denney’s more of a run-first defensive end who adds depth. It’s obvious Houston wanted to add DE help after Week 1, when you can sign veterans without guaranteeing a full year’s salary, and Barwin’s injury meant signing two instead of one. But getting Ogunleye and Denney at this point in the calendar is a big plus for a contender like the Texans. Lions (sign CB Nathan Vasher) – After putting CB Aaron Berry on injured reserve, the Lions added Vasher, a former Bear who didn’t make the Chargers’ opening roster. Vasher isn’t the player he was in his prime, but he’s a serviceable corner who should help a secondary that’s below average. Jets (sign DT Howard Green) – Green, who was with the Redskins in training camp, returns to the Jets after Kris Jenkins’ season-ending injury. Green played 12 games for the Jets last year, and the seven-year vet is sturdy enough to hold up and give Mike DeVito and Sione Pouha a break inside. 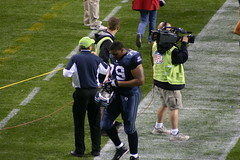 Seahawks (sign OG Mansfield Wrotto) – Wrotto, who was cut just before the season by the Seahawks, came back to add depth after OG Max Unger’s season-ending injury. Wrotto is a versatile player who can fill in at several positions without killing a team. Jaguars (sign TE Ernest Wilford) – Wilford, who has played five of his six seasons with the Jaguars, comes back now that his contract isn’t guaranteed. Wilford started his career with little speed and now has even less, which is why he has moved to tight end, but he’s still a reliable receiver when he gets open and gets the ball. Eagles (add FB Owen Schmitt, promote TE Garrett Mills) – Schmitt comes in to act as a West Coast-offense fullback replacing Leonard Weaver, who’s out for the season. Schmitt is a hard-nosed runner and blocker, but he lacks Weaver’s explosiveness. Mills can also help replace Weaver in a tight end/H-back role. Bears (sign LB Rod Wilson) – Wilson spent the first three years of his career with the Bears, and now he returns to provide depth after Hunter Hillenmeyer was forced onto injured reserve by a preseason concussion. Dolphins (sign DE Lionel Dotson) – The Dolphins brought back Dotson to help fill in while Jared Odrick is sidelined by injury. Packers (sign RB Dmitri Nance and DE Jarius Wynn) – Nance, who was signed off the Falcons’ practice squad, becomes the only backup for Brandon Jackson after Ryan Grant’s season-ending injury. The Pack also brought Wynn back to provide depth after Justin Harrell’s season-ending injury. Patriots (promote RB Javarris James from the practice squad) – James, an undrafted free agent from Miami, got moved up to the main roster to replace Laurence Maroney, who was traded to Denver. Giants (promote TE Bear Pascoe from the practice squad) – Pascoe, a sixth-round pick in 2009 for San Francisco, played for the Giants last year but just missed the main roster as the season opened this year. But with Kevin Boss feeling ill effects from a concussion, Pascoe came up to supplement Travis Beckum, the only healthy tight end on the roster. Ravens (sign CB Prince Miller) – Miller, an undrafted rookie who was in camp with the Ravens but spent Week 1 on the Patriots’ practice squad, comes in to help on punt returns. I’ve seen Miller play and play well since he was a freshman in high school, and he’s always been an explosive returner. He’s a little small to be an NFL corner regularly, but Miller should help in the return game and keep Tom Zbikowski, who is starting for Ed Reed right now, fresh for his defensive duties. Rams (claim LB Bryan Kehl on waivers) – Kehl was cut by the Giants so that they Giants could add a tight end to fill in for Kevin Boss, but the 2008 fourth-round pick was quickly claimed by the Rams. Head coach Steve Spagnuolo was in New York when Kehl was drafted, so he must think Kehl has potential to help pretty quickly. 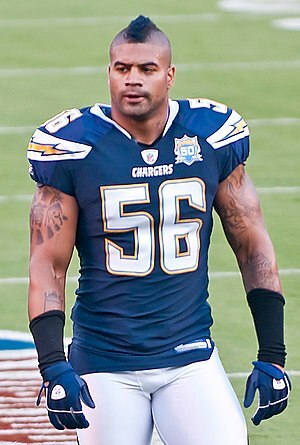 Chargers (sign LS James Dearth) – Dearth comes on board to replace LS David Binn, who had to go on injured reserve. OP: Whither Julius Peppers, 2010? Last offseason, we pondered the question of whither Julius Peppers (not once but twice), and then we reflected once Peppers decided to play the season in Carolina for the $18-million plus franchise tag. Now, Peppers is on the precipe of the open market again, and we once again think we know how this whole situation should play out. If the Panthers want to keep Peppers for another year, it’ll cost 20 percent more than it did in ’09. That $20-million-plus outlay is strong, even in an uncapped year. And since Peppers continues to seem disinclined to sign a long-time deal in Carolina, it seems as though the Panthers’ only choices are the franchise tag or letting Peppers go. And letting him go is what the Panthers should and will do. Peppers had 10.5 sacks last year, which is solid but not spectacular enough to justify the league-topping salary. And that’s pretty much his average season, since he has 81 career sacks in eight years. He’s an immense talent who is a very good but not great player. Even more, Peppers doesn’t want to be a franchise standard. He’s felt the pressure of being a North Carolina kid who went to North Carolina and then played his career at home, and he’s ready to leave the Carolinas for greener pastures somewhere else. All those reasons are fine, but if the Panthers didn’t have other options on the free agent market, letting Peppers go would be unadvisable. But this year, even with the market limited by the potential uncapped year, there are pass rushers available. Someone like Aaron Kampman of Green Bay or Kyle Vanden Bosch of Tennessee or Richard Seymour of Oakland or even Adewale Ogunleye of Chicago could approach 10 sacks at a far lesser cost than what Peppers would cost in Carolina. And while Seymour and perhaps Vanden Bosch will get tagged, a couple of those guys will break free. And the Panthers have always shown the willingness to make quick, aggressive strikes in free agency – the kind of approach that could guarantee the arrival of someone like Kampman. This move would save the Panthers $10 million or more this year, and it could help them hold onto Tyler Brayton, a solid if unspectacular run-stuffer who has started across from Peppers the last couple of years. So that’s what the Panthers should do, and that’s what we expect they will do. Panthers fans, say goodbye to Peppers – and hope that a Vanden Bosch or a Kampman is on his way to Charlotte ASAP.